In life, a week can feel like eternity, or it can feel as though you’ve blinked and missed it. For me, this week has been the latter. Given all the dramas from last week’s attempt at chemo, and the uncertaintity of what was to come, the days melted away before me. As the morning light filtered through my bedroom blinds, and the kookaburras sung their morning chant, I realised, today was Thursday. Today was chemo day. This was definitely a week where I blinked and suddenly I was transported seven days further in the future. I’ve had a challenging yet extremely satisfying week: a lovely visit from another interstate visitor (and another beautiful present), a lot of phone calls, emails and brain power getting parkrun moving forward, time spent perfecting my Pho recipe, and as most of you would have seen, I stumbled across a perfect ‘healthier’ treat to satisfy my chocolate and peanut butter addiction. A big shout out to Belle Gibson, and The Whole Pantry app for this treasure. There have already been discussions within the house about alternative filling options – raspberry filling is the next request. For the first time, in a very long time, routine is present in my life. The new proposed regime means: every Tuesday I have a blood test, and every Thursday I have chemo. I am considering making Wednesday my ‘Ladies who Lunch’ day. For seven years working as cabin crew, the start of the working week could be Monday, but it’s most likely Friday, Saturday or Sunday. Can you see why I’m feeling extremely chuffed with my new schedule. Let me rephrase: I WAS feeling extremely chuffed. Today’s chemo was NOT a success, again. Instead I graduated: How to Fail Chemo 101. If there was an actual award, I’m sure I would have received a high distinction. Maybe my body is having “Chemo Envy.” It wants to try all the possible combinations. I am not going to bore you with a minute-by-minute description of today’s events – it was no different to the other times. Actually I lie, it was worse. This time I was physically sick (I swear it was karma from my hips for eating hot chips for morning tea…). Here is a summary: went to the hospital, saw my oncologist (she’s back from Paris), sat in the recliner chair (not seven), had cannula inserted (first attempt), watched the white liquid drop-by-drop move through the tube inching closer to my veins, blushed, passed out from Phenergan, talked about the alternative, then came home. Goodbye five hours of my life. What now? The regime needs to change, again. Say hello to: FEC. It’s a combination of three drugs – the ‘C’ is the drug I have been receiving in my original TC combination. This was the sole drug that made it through my veins without throwing a hissy-fit last week, after I recovered from my T reaction. This is an older style chemotherapy combination. It has the same effectiveness as my original prescribed TC combination. Dr Olivera informed me that people do not have allergic reactions to FEC – but she’s coming prepared incase I decide to be difficult again. FEC is usually administered every 3 weeks, for 6-8 rounds. Since I have already received some chemotherapy, she’s only prescribing 4 rounds. It does mean I go back to a 3 weekly cycle. Goodbye routine. Hello waiting around, again. If you wonder how I am so relaxed and tolerant with all the changes, look no further. Working for Qantas, crew are given a two-month roster – life is planned in 2 month increments. Even when you think you have outsmarted the roster gods, and operations, there still a chance things can change: erupting volcanos, airline strikes, standby days…all can alter and change your life. Getting in a huff gets you nowhere when things are out of your control. This is definitely out of my control. My next chemo is booked for November 28th. I hardly had any drugs administered today, and last week I only received half – just the C. I am experiencing zero side effects and feeling like I could race a triathlon. Mother suggested I go away next weekend. “Maybe you could go down to Melbourne for the weekend,” she said. Do I need a hearing aid? Did those words actually come out of her mouth? Before you start dialling DOCS and reporting her for bad parenting (can you still report a parent if their child is 32? ), mother has asked my oncologist in the past if flying during chemo is allowed (we were supposed to go to NZ for Christmas this year). Obviously, if any new side effects make themselves present, I won’t be travelling. I’m not daft (as Kim Barnes would like to say). But kudos to mother for making the suggestion. For now, I am back home. Back in the recliner chair, back at stage one. I feel as though this process hasn’t really started. Every speed bump and set-back is pushing my end date further and further into the future. How do I feel about this? So be it. Another six weeks now is nothing in the grand scheme of things. 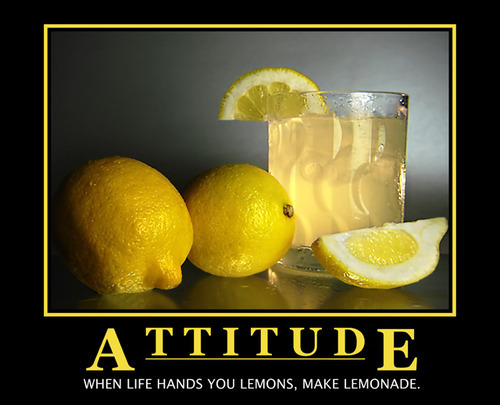 I don’t mind if life keeps throwing me lemons. I like lemonade.